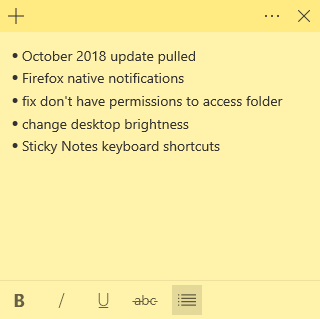 Sticky Notes has been improved a lot in Windows 10 October 2018 update. The new Sticky Notes can now sync between devices, supports search function, can recognize handwriting, add entries to Cortana, support for dark mode, light accent colors, etc. Additionally, Sticky Notes now has a dedicated formatting bar that lets you format text in bold, italic, underline, strikethrough, and even toggle list items. Sticky Notes also gained a hub-like area where it lists all your sticky notes. This makes it easy to create and manage multiple sticky notes. If you are like me and uses sticky notes extensively, its a joy to use it with all the new options. Though the new Sticky Notes is nothing hard use and the formatting bar makes it easy to quickly format text within the sticky notes, you can make it a bit better using keyboard shortcuts. The new version of Sticky Notes has several different keyboard shortcuts, 17 to be precise, to get most out of it. So, it is only natural that you want to know and use sticky notes keyboard shortcuts. Your productivity will be faster and better when using keyboard shortcuts. Here are the keyboard shortcuts for Sticky Notes that every Windows 10 user should know. Below are all the Sticky Notes keyboard shortcuts that are available as of now. Hope that helps. I will update the article if I find any more sticky notes shortcuts. Until then, use the ones shared and share your experiences with me in the comments section below. Here is a List of App URI commands for store apps in Windows 10.